Step 1 Mix together the cream cheese, pimentos, dill, 2 teaspoons chopped watercress leaves, lemon juice, salt and pepper. Step 2 Cut a slit from the center to the edge of each cucumber slice. Set the slices aside. Step 3Spread a portion of the cream cheese mixture thinly over the white bread. Using a small, round cookie cutter, cut rounds roughly the size of the tomato slices from each piece of bread. Step 4Place a slice of tomato on each round. Spoon the remaining cream cheese mixture in a piping bag with a star tip. Pipe a star about the size of a quarter in the center of each tomato slice. Step 5Take each cucumber slice, grasp the corners next to the slit and twist in opposite directions to form a decorative spiral. Place one on each sandwich; add a sprig of watercress on the side. Repeat until all the sandwiches are assembled. In Recipes-list.com we have selected the most viewed recipes from category - Appetizers Sandwiches Vegetarian . Enjoy the best recipes specially selected for you! 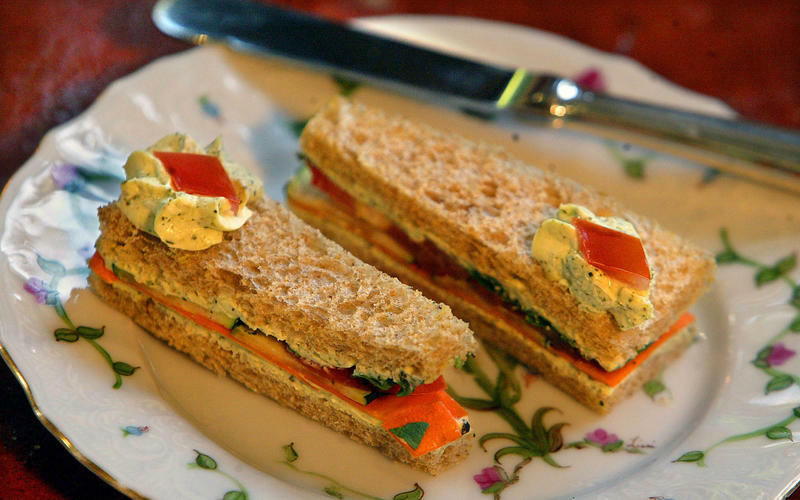 Cucumber and tomato tea sandwiches is the right choice that will satisfy all your claims.